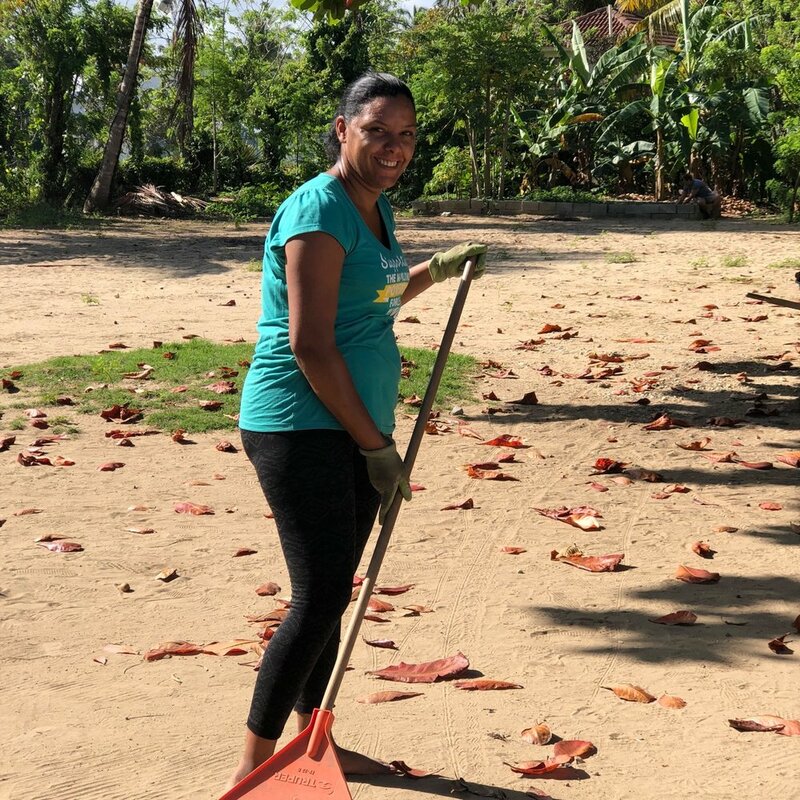 Patricia Thorndike Suriel has been passionate about alleviating extreme poverty in the Dominican Republic since 1992 when she first arrived on the island of Hispaniola. Beginning with collecting donations of a few books through her adventure travel company, Iguana Mama, to create the first library, she then joined with friends, colleagues, and volunteers from around the world to mobilize the establishment of the first educational nonprofit, The DREAM Project, in Cabarete. For these pioneer initiatives she received the Outstanding Citizen Award from the U.S. Embassy in the Dominican Republic, which recognizes contributions made by a U.S. citizen abroad. After serving the Cabarete community and advocating for equal access to quality education for more than 15 years, Suriel recognized a critical need for innovative programs specifically for girls. In 2009, in partnership with a group of passionate advisors, donors, volunteers and community members, Suriel founded The Mariposa DR Foundation – a nonprofit dedicated to educating and empowering girls to end generational poverty. Today, the Mariposa Center for Girls in Cabarete, Dominican Republic serves more than 150 girls ages 8-21 and their families and has hosted over 2,000 international visitors who are eager to learn about Mariposa’s work. Jessica’s love affair with the Dominican Republic began in 2003 when she first came to Cabarete on vacation. Her work was instrumental in the formation of the Mariposa DR Foundation, earning her the Martin Luther King Social Justice award from her alma mater, Dartmouth College. Now back in her hometown of Chicago, Illinois, Jessica continues to champion for girls in the Dominican Republic and raise awareness of how educating and empowering young women is the only way to affect lasting change. Originally from California, Amanda Bucci graduated from U.C. Santa Barbara with a B.A. in Women’s Studies and Sociology and later studied traditional midwifery in Puerto Rico. After traveling extensively through the developing world, she joined Peace Corps and served as a volunteer in Puerto Plata, Dominican Republic (2002-2004). Amanda has a broad knowledge and years of practical experience in the area of sustainability and environmental education. Here at the foundation, she coordinates our environmental programs and shares her expertise in this area with over 600 volunteers a year. Amanda and her family happily live “off-the-grid” in a small sustainable farm on the north coast. Pamela’s passion for graphics began in her early teen years and has since blossomed into a successful career in graphic design. She studied Graphic Design, Fine Arts and Art Direction at Altos de Chavon School of Design and the School of Fine Arts in Santo Domingo, and Advertising in the University APEC (Universidad Acción Pro-Educación y Cultura). Pamela is originally from Santo Domingo, and decided to move to the North Coast nine years ago to become an independent graphic designer and enjoy the waves. She is the in-house graphic designer for Mariposa, lending her talents to the “Cabarete Responsible Tourism & Investment Guide” and our other publications. An avid surfer, she gives lessons to our girls and is fluent in Spanish and English. She hopes to one day have the equipment at the center to teach our older Mariposas graphic design as part of the job skills program! Aislinn had been with the Mariposa DR Foundation since the beginning, first as a volunteer and then as an Executive Board Member. She served as President of the Board from 2011-2017. Aislinn has a Master’s degree in education from Harvard and her undergraduate degree from the University of Notre Dame. She is based out of Massachusetts, but gets down to the DR as often as she can. Yahaira started her first job in 2006 at The DREAM Project and iIn 2009, she followed Suriel to Cabarete Coffee Company where she became the top barista and shop manager. Yahaira is now the office manager at The Mariposa Center for Girls. Yahaira holds a degree in marketing from UTESA in Puerto Plata and has a young daughter, Zoe. Yahaira is a great role model for all the Mariposa girls and a shining example of what an empowered young woman can accomplish in her community. Fernanda is a talented young woman who graduated from Mariposa programs to work for the Foundation. As the sixth of eight children, she is one of the few people in her family who has finished high school. At Mariposa, Fernanda enjoys being part of of a wonderful team and being able to give back by sharing what she learned with the girls at the Center. She hopes to be a great example to her two children, the girls at Mariposa and her community. A Cabarete local, Dilsaurys joined our team at the beginning of 2018 as a skilled educator and library administrator. While she is not working at Mariposa, Dilsaurys attends the Technical University of Santiago, where she is completing her studies in early childhood education. At Mariposa, Dilsaurys teaches reading, oversees both the young adult and children’s library, and assists with one-on-one tutoring. Dilsaurys aims to grow and develop as an educator so she can continue to give back to her community. Miriam is originally from Bolivia but has lived in the Dominican Republic for over 5 years. Miriam has more than 20 years of experience working in development and program management in a variety of capacities. She is polyglot and is fluent in English, Spanish, French and Portuguese. Miriam Graduated from United World Colleges and has served in the UWC International Board, Bolivian National Committee and right now as President of the Dominican Republic National Committee. Here at Mariposa, Miriam will be working to better develop our Mariposa Volando Program and supporting programs and management in a variety of ways. Yanaira is a full-time intern at Mariposa, working at the front office as an administrative assistant. Yanaira is a Mariposa Volando, and has been with the Foundation since she was 11. With Mariposa’s support, she studies business administration and has plans to run a business one day. Originally from Santo Domingo, Dominican Republic, Rebecca Dugue has now lived in Cabarete for 18 years. She loves music and reading and likes to explore new things. Besides her work in tutoring at Mariposa DR Foundation, Dugue is completing her bachelor's degree in psychology at the Technical University of Santiago. From a young age, she has worked with various communities by leading reading-clubs and organizing early childhood programming for parents. It is a pleasure to dedicate her energy and love where the results of her work are apparent. Betty is a year-long volunteer at Mariposa and a Princeton in Latin America Fellow. She was born and raised in Guadalajara, Mexico, but has also lived in San Antonio, Texas. She recently graduated from Columbia University (2018) with a B.A in Psychology. In the summer of 2017, Betty completed a global health fellowship in La Romana, Dominican Republic through ICAP at Columbia. She is excited to be teaching health classes at Mariposa, and to continue promoting comprehensive health education among youth. Victor graduated from Middlebury College in 2016 with a concentration in Japanese and minors in Portuguese and Education Studies. His love for Middlebury encouraged him to stay an additional two years at his alma matter, where he worked as an Admissions Counselor who recruited and helped select each incoming class. Now, Victor is ready take a break from­­ Vermont and NYC to return to the DR—where he will work as a martial arts and dance instructor at the Mariposa Foundation. Johana Mata was born in Mexico and raised in Houston, Texas. She recently graduated from Wellesley College, class of 2017, with a degree in international relations and French. She is excited to be a year-long volunteer through the Princeton in Latin America fellowship at Mariposa, and both teach the Mariposa girls and learn more about non-profit administration at an organization dedicated to supporting the world’s most powerful force for change! After her year at Mariposa, Johana hopes to return to graduate school, and also pursue a career in international development. Sandra is originally from El Salvador but moved to Los Angeles, California at a young age. Sandra recently graduated from Middlebury College with a major in Latin American Studies. Since high school, Sandra has danced and performed for a couple of student-led dance crews. Sandra is looking forward to connecting with the young women at the Mariposa Foundation through dancing. Sandra is excited for the growth and adventures waiting for them in DR.
Vanessa Smith is a recent graduate from Princeton University. While in school, she majored in Anthropology and minored in Latin American Studies and Spanish. During her time at Princeton she was fortunate to be captain of the Princeton Women’s Varsity Basketball team, and to be involved in other creative student-led initiatives on campus such as mentoring programs and volunteering. Here at the center, she teaches leadership classes, current events, social activism, history and wellness. She has also been involved in the planning processes for our upcoming Museum of the Girl. She is so excited to be working with our girls and looks forward to another promising year! Harriet Trower is a British Geography graduate from the University of Leeds. Since graduating in 2011 she has taken courses in Environmental Management, Community Development, Herbal Medicine and a life changing Permaculture Design Course. Her love for the natural environment started young from helping her parents and grandparents in their allotments. She was fascinated by the growing process, and enjoyed harvesting and cooking what she had sowed herself! In 2017 she became a Forest School leader in the UK, and is keen to spread the empowering student led learning approach. Her mission is to inspire the girls to love Mother Earth, because if you love something you will always want to take care of it. Emma Wingreen is a second-year volunteer at Mariposa. She recently graduated from Princeton University with a degree from the Woodrow Wilson School and certificates in Latin American Studies and Spanish Language and Culture. This past year at Mariposa DR Foundation, she implemented a digital literacy campaign and taught a number of Introduction to STEM and Robotics courses for girls and young women. In her second year, she is excited to continue teaching and to take on new responsibilities in her role as a Monitoring, Evaluation and Learning Fellow. Gladys is in charge of our kitchen and all the meals we serve to our girls. Vital to our commitment to provide healthy and consistent nutrition to Mariposa girls, Gladys prepares and serves breakfast and afternoon snack to all of our girls everyday. She also aids in the cleaning and maintenance of our eatery, and has offered a helping hand in our cooking classes. As an older sister of a graduated Mariposa, Gladys has seen the positive impact that our programs have and is passionate about her contributions to our team. Maria Alexandra Rivas Lopez has a degree in Education and her teaching experience includes 2 years teaching a special needs child and 5 years working in a private school with children 6-8 years old. As a teacher she focuses not just on teaching content, but also uses mediating strategies to develop sensitivity towards animals and the environment, as well as social and emotional learning for personal growth and daily life. At Mariposa she works in our literacy program and also sews in our Mariposa Upcycled Sails social enterprise. Born in Cabarete and raised in the countryside near Río San Juan, Luís brings his love of the countryside and knowledge of native plants and trees, and their care, to Mariposa. Luís enjoys working to ensure a safe and clean learning space for our girls. His responsibilities range from pool maintenance to kitchen help, and he works alongside Jelsi in property and facility maintenance. A Mariposa mother, Belkys began working as a seamstress in our Upcycled project two years ago. She assists in the production and design of our Upcycled products, which include backpacks, wristlets, and reusable shopping bags. She also assists in sewing classes for Mariposa girls. A mother of three, Belkys enjoys being a part of a team dedicated to educating and uplifting girls in her community. Eva was born and raised in Cabarete and she comes from a humble family. Her parents are Dominican and she has three children that she raises on her own.